People are the most important and one of the most expensive assets for most organizations. For this reason, optimized organizational processes can significantly contribute to a company’s bottom line. Optimized processes can have tremendous impacts on the effectiveness of the workforce, especially when managed appropriately using applicable metrics to drive employee behavioral change. Employee costs are extensive and often come close to half of a company’s overall expense; therefore, even a slight impact on just a portion of the employee pool through optimized processes can produce immediate results. Resch Group understands that employees are the primary cost factor within an organization, but also are the primary asset that produces business value, increases business growth and improves overall competitiveness for their companies. Processes that affect and influence this vital asset base can have a long-lasting impact on an organization. 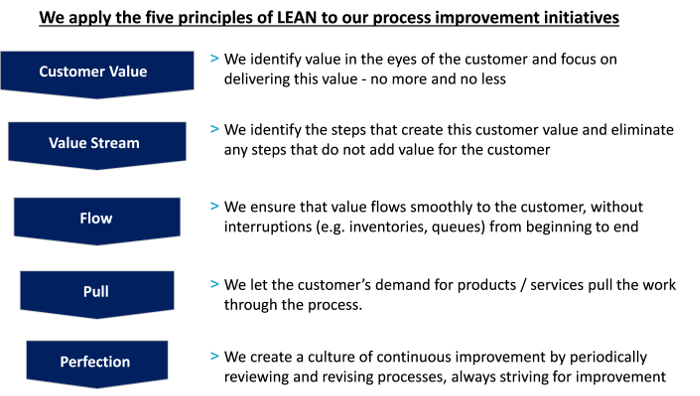 We apply LEAN principles to all our process improvement initiatives. LEAN or LEAN Thinking is the mindset of the way an organization does business. It consists of principles with the goal of satisfying customers with the highest possible quality at the lowest cost in the quickest time. 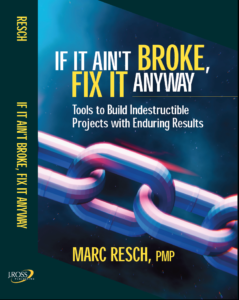 LEAN is the systematic elimination of waste from all aspects of an organization’s operations, where waste is viewed as any use or loss of resources that does not lead directly to creating the product or service a customer wants, when they want it. Our approach includes a detailed Current State Assessment where we collect baseline information, conduct ‘Voice of the Customer’ sessions, develop process maps, identify process waste, or non-value adding activities, and develop hypotheses for process improvements. We then work closely with our customers in producing Target State Designs, by conducting deep dive sessions to identify process improvements and producing detailed target state process maps. Finally, we develop an Implementation Roadmap, which includes prioritizing process improvement initiatives, establishing timelines and producing dashboard metrics to track the improvements. Give us a call at 201-803-4653 to find out how we can help you with your process improvement initiatives or simply fill out our online form and we will be in touch with you.